Scamming a scam? Brilliance by an Arab. PETALING JAYA: A Lebanese wholesale jeweller has filed a RM60 million suit against Rosmah Mansor for the return of 44 pieces of jewellery seized during police raids of properties linked to her husband Najib Razak in May. 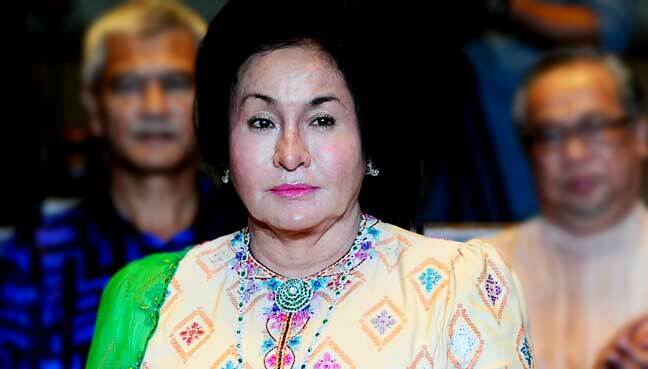 According to Malaysiakini, Global Royalty Trading SAL, a company based in Beirut, filed the US$14.79 million (RM59.831 million) suit against Rosmah at the Kuala Lumpur High Court on June 26. The portal said it had sighted documents including Global Royalty’s statement of claim which said Rosmah was a long-standing customer who often received consignments of jewellery to evaluate and purchase. Global Royalty said Rosmah would sometimes borrow the jewellery as well, which would be received by either her or her agent in Kuala Lumpur, Singapore or Dubai. In the consignment dated Feb 10 this year, the report said 44 pieces of jewellery were sent to Rosmah, including diamond necklaces, rings, bracelets, earrings and a tiara worth between US$124,000 and US$925,000 each. Global Royalty cited a letter dated May 22 in which Rosmah allegedly acknowledged receipt of the jewellery. However, it said in its statement of claim that the items were no longer with Rosmah as they had been seized by the authorities. The report said Global Royalty is seeking a court declaration that it is the rightful owner of the jewellery, and that the items must be returned failing which Rosmah must pay the amount determined based on the value of the pieces. Last month, the police said over RM1 billion worth of items was seized in raids at several premises linked to Najib after Pakatan Harapan took over Putrajaya in the May 9 polls. These included 72 bags of cash and valuables, and hundreds of boxes containing luxury handbags. Thirty-five of the bags contained RM116.7 million in cash while another 25 bags contained 12,000 items of jewellery, including rings and diamond earrings estimated to cost RM440 million in materials alone. Police said these included 1,400 chains, 2,200 rings, 2,800 pairs of earrings and 14 tiaras. The most valuable piece of jewellery was a white diamond necklace estimated to cost RM6.4 million. Last week, Najib was charged with three counts of criminal breach of trust and one count of abuse of power in relation to RM42 million channelled into his personal bank account from former 1MDB subsidiary SRC International. He pleaded not guilty to all four charges. « Arrests in August; 9/11 announcement in September; and Jubilee in October?